You've found the “U.S. 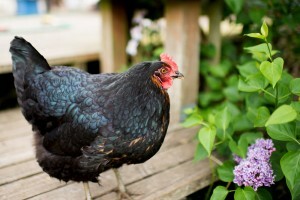 Jersey Giant Chicken Breeders” page here at Hobby Farm Wisdom! If this is the first time you have visited our site: Welcome! The Jersey Giant chicken is a breed that originated in that state of New Jersey and true to its name, is the largest of the chicken breeds. Roosters average 13 pounds, while hens average 11 pounds. Originally bred with the intent of replacing turkey as the main source of meat at the time, Jersey Giants were developed by crossing Black Javas, Black Langshans and Dark Brahmas. It takes a great deal of time and food for Jersey Giant chickens to reach their full size and this has led to a decrease in their popularity. However, they are an extremely docile breed and rarely get aggressive, making them a good bird for interacting with other breeds and pets.